If the only strategy you ever really developed for Foosball involved wildly spinning your players until the ball somehow appeared in your opponent's goal, Jet-Ball might be more up your alley. 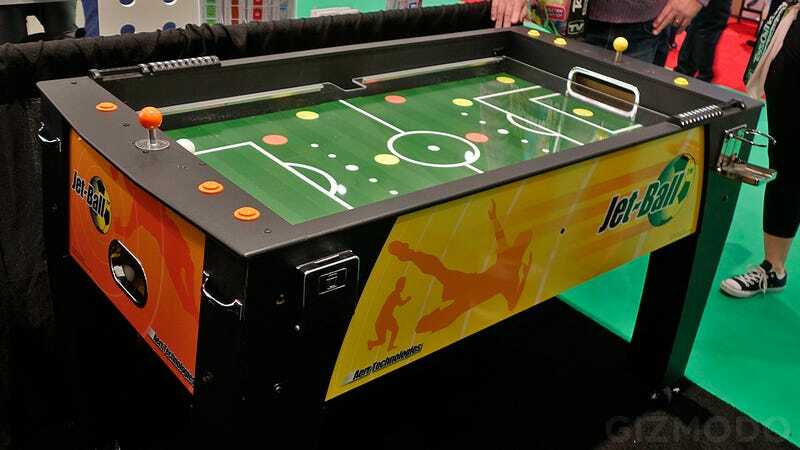 Those spindled soccer players have been replaced with a series of directional vents on the playing surface, and to move the ball around you trigger strong blasts of air using a joystick and arcade-style buttons. Learning how to play Jet-Ball doesn't take long. The joystick each player has is used to select and highlight one of the vents on the field, while the arcade buttons trigger a powerful blast of air. Just like with Foosball you can develop passing strategies to move a ball down the field from vent to vent, but the game moves incredibly fast and it can take a few matches to get comfortable with using the joystick to quickly select the vent you want.